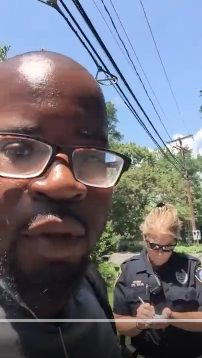 A set of videos posted to YouTube by a black Bridgeport man shows police stopping him as he rode his bike to work at Tokeneke Country Club, and an online petition says police should apologize to him and undergo racial sensitivity training. Image from Matthew McGee’s third video on YouTube showing the incident. The officer who stopped him is shown. The traffic stop, made by a female Darien police officer, took place on one of the private Tokeneke roads leading to the country club. The Bridgeport man told the police officer that he’s a cook who’s been working at the club for two years. According to the petition, he rides his bicycle to a train station, then rides it from another station to his job. The video recording shows the police officer is civil, even courteous to the bike rider, and explains that police are concerned about several burglaries in the area (there have been four in Tokeneke in recent weeks — see Darienite.com’s articles here and here). The bike rider appears upset (he tells the officer he’s “a little” upset) that he’s being stopped while plenty of cars whiz by who have not been stopped. He indicates in a note posted on YouTube with the video that he finds it unbelievable that police might think he’d burglarize a home and use a bike to get to and from them. On July 18th, 2016 Matthew McGee was doing his regular commute routine. He rides his bike to the train station in Bridgeport, CT. and then rides his bike from the station to his job at a suburban country club on a private road in Darien CT. Please watch the video. WARNING!! You WILL see a man who is upset as any of us would be if we were riding a bike period and the police asked us if we saw anything because their were burglaries in the area. In anticipation of the stop he uses profanity in the video talking to himself but NEVER at the police officer. There are clearly vehicles driving by that could be asked the same thing. Did he fit the description of the burglar or were they just asking what he saw doing his bike ride to work? You decide!! They even called his job to confirm if he really worked there! At a time when police need to be building bridges of trust it is things like this that continue to perpetuate more mistrust amongst the Black community and law enforcement nationwide. Someone does not have to be shot or killed to highlight a long standing issue in our communities. This man felt violated, fearful, confused, and sad all at once. We all want the bad guys caught no matter what race but we want our constitutional rights observed as well. Americans of all races are seeing some things on video that would have been just hearsay in the past. I think we owe a lot to Google and Apple for the ubiquitous cellphone camera. It is helping us be a better country by letting us see the truth with our own eyes. This petition wants 2 things 1. An apology to Mr. McGee and 2. Racial sensitivity training for its officers. Lets be clear this is an attempt to communicate the need for solutions, not just frustration or lip service. Police officers are human with all the frailties and idiosyncrasy’s that we all have and are subject to with a tough job and mistakes can be made. I hope the First Selectman and Police Chief will not just dismiss this as an anomaly or baseless concern. Signing this petition can help achieve that. We can make America better if we all understand that Black males are people too. I know some Darien residents and I know they don’t condone this. I am quite sure it is not what they want their town to be known for. Lets help make things better for all of us, Sign the Petition right now. In what appears to be the first video, which lasts 50 seconds, McGee is riding his bicycle with a patrol car following him. Police following — me on a bike. […] [expletive] we gotta go through.” The police siren blares briefly and that video ends. In what seems to be the second video, which lasts 27 seconds, he’s shown being pulled over. In the third video, 3 minutes, 17 seconds long, he talks with the officer who pulled him over. The female officer who stopped him called him “sir” and appears to have been civil with him, even courteous. Officer: “I appreciate your cooperation. She asks him where he works and what he does there, then the officer can be heard repeating the information into a radio. About 10 or 15 years ago, when a cousin began living with us in Darien, he was stopped by police detectives on Hollow Tree Ridge Road, just south of I-95. There had been a larceny of some sort, not far away, and the police wanted to see what was in his backpack. They searched him and the backpack, I think at one point having him put his hands on an unmarked police car to pat him down (he had nothing illegal on him). I don’t know whether it was right or wrong, but I do know he was intensely upset about the encounter. He’s white, and was never in trouble with the law before or since.